I have a fun and quick little diy for you today! 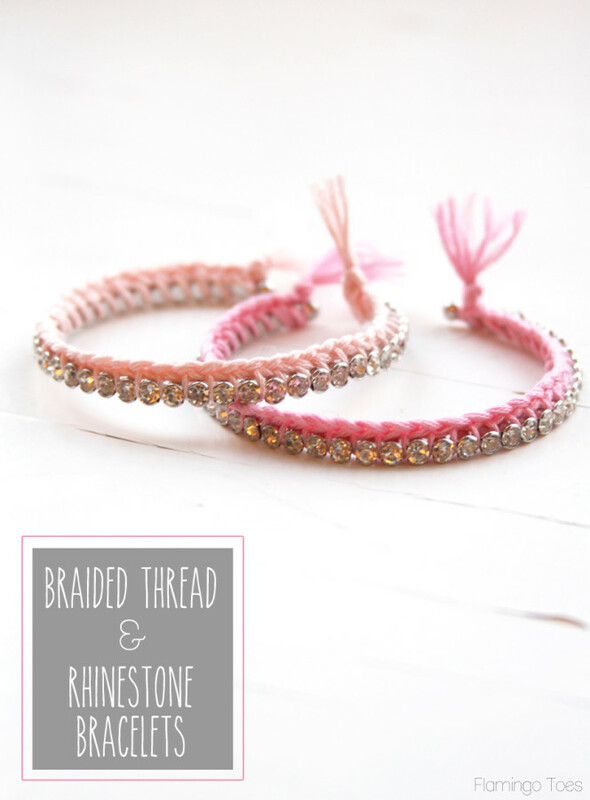 These little Braided Thread and Rhinestone Bracelets are super easy to make – but they are so cute!! 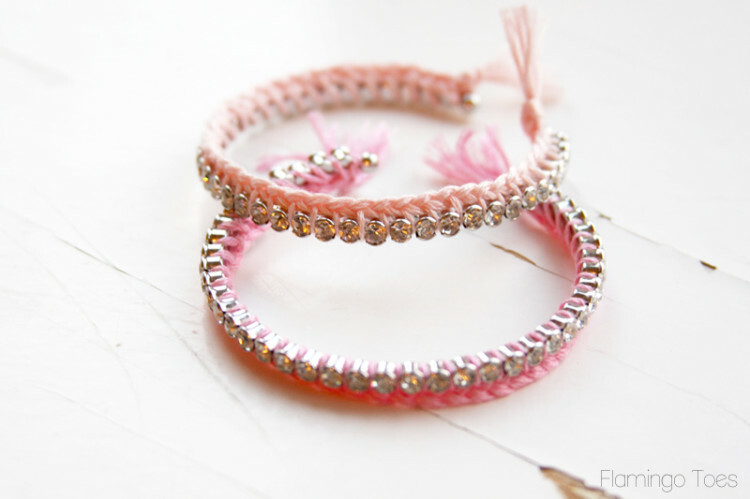 They have a fun bit of braided floss to go with the bling of the rhinestones – so they are so easy to make up in your favorite colors. I think they would be so fun for a little sporting game support too – you could just make them up in your favorite teams colors. Since we’ve moved to Tennessee I have discovered that there is just a bit of fall football enthusiasm here. In fact we are living in a sea of orange. It’s so fun. So you could grab some pretty rhinestone bracelets and have a fun game accessory in just about 15 minutes! Boom. I think I’ll stick with pink for now though – cute at any time of year. Ready for a super fast tutorial? Here ya go! 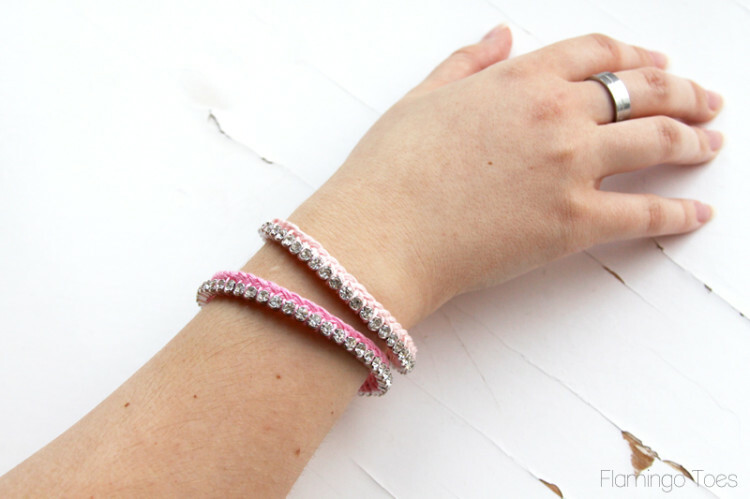 Rhinestone bracelet cuff (or a rhinestone bangle) – this little bangle came from Jo-Ann but you could make your own by taking a small bangle or thin cuff and gluing a rhinestone strand to it! 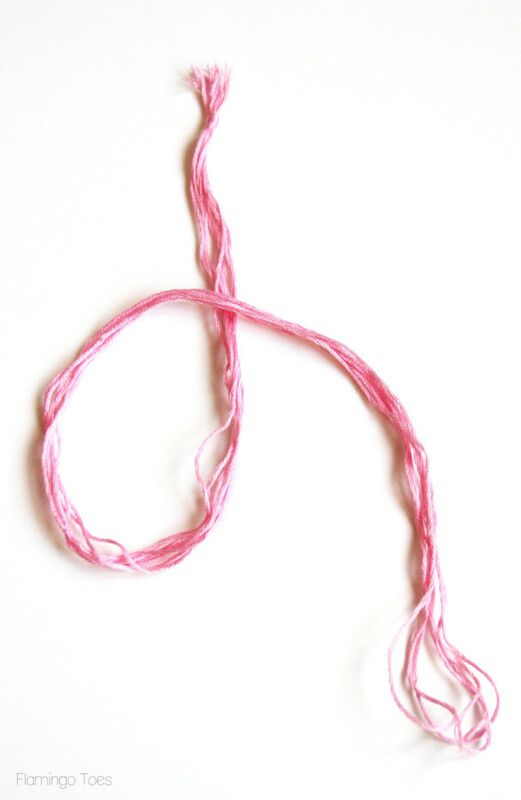 Start by measuring out 6 strands of floss – 20″ each and one strand that is about 40″. Knot them all together at one end about 3/4″ from the end. Separate out the floss strands on the end. 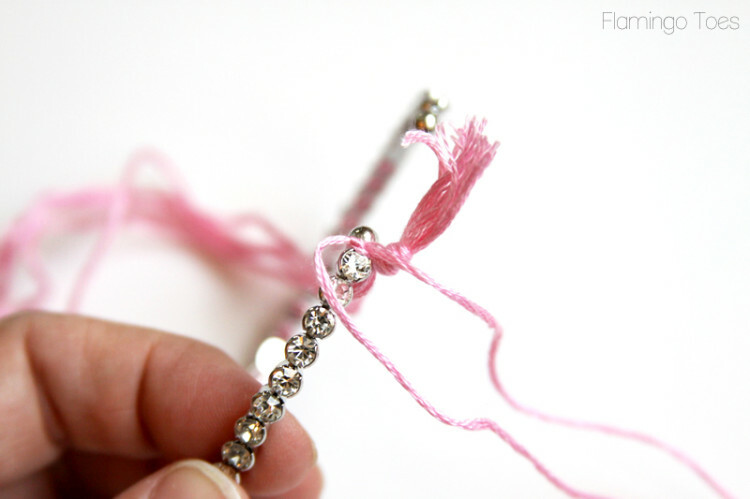 Take two of floss strands and knot them around one end of the rhinestone bracelet. I used one of the regular strands and the long strand. Separate out the long strand and keep it away from the others. Take the remaining six strands and do a loose braid, with two strands on each section. Keep braiding until you have enough to cover the length of your bracelet. 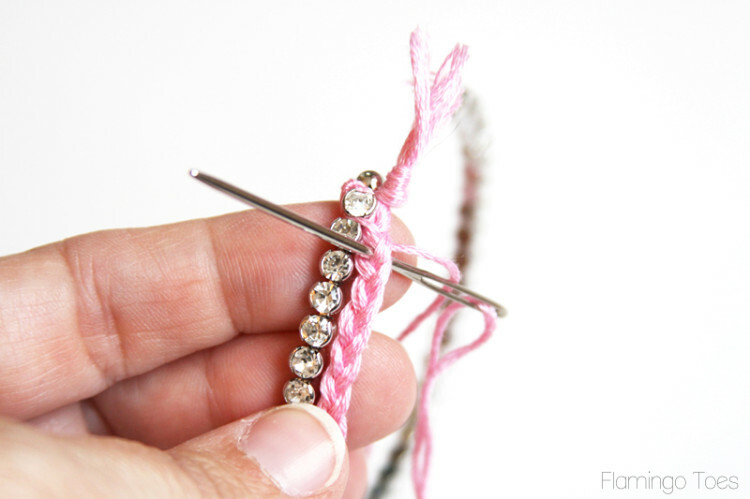 Lay the braid along the bracelet. Thread the needle with the extra strand and bring the needle up through the middle of the braid. Wrap the floss around the first rhinestone, then bring it back up through the braid next to the next lowest rhinestone. 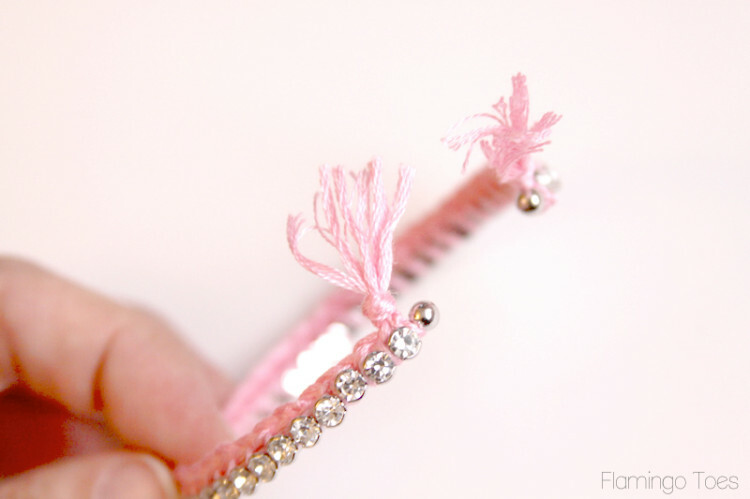 Continue “sewing” the braid to the rhinestones, wrapping the floss as you go, until you get to the end of the bracelet. Knot two strands of the floss around the end of the bracelet, then knot all seven strands together. Trim off the extra so you have about 3/4″ left. Separate out the ends of the floss. That’s it!! So easy right?! I just love how that thread looks against the sparkle of the rhinestones. You can make them in different colors, or coordinate them to wear together. I seem to have missed how the bracelet closes if you just have alength of rinestones? Especeally if you don’t want to tie it on. Hi! The bracelets I used were a rhinestone cuff I found at Jo-Ann. If you use a length of rhinestones trim you’d have to either glue them to a little bangle, or tie them on. Either way would be cute! 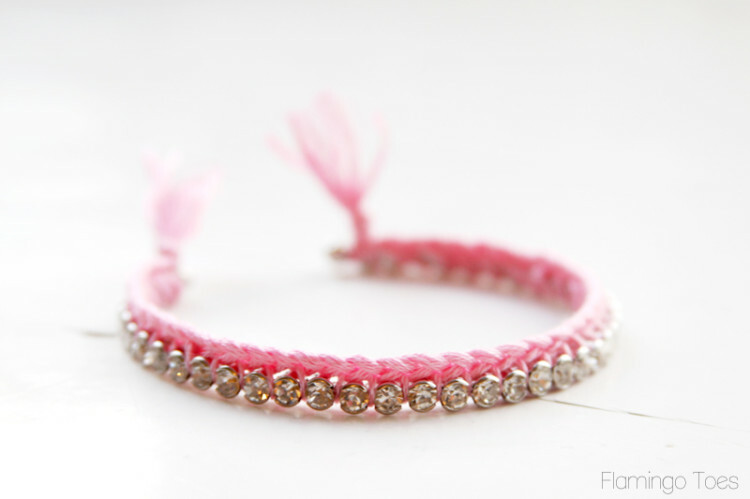 I am not much of a rhinestone person but think I might try it with a beaded bracelet. I could see both going for teams around here. Maybe I will see if anyone likes them. Have you tried braiding more than one color. One of our local teams use red and black. Thought that might be a good combination. So pretty! With the rhinestones they reminded me of the bracelets that you taught us to make at SNAP! So cute!!! Roll Tide!!! Welcome to the SEC and land of football and bling!!! Perfect!!! “…a little football enthusiasm…” lol Are you kidding?! It’s a RELIGION! Unfortunately I am in UK and do not have a Jo-Ann’s so I am going to have to use ingenuity when I come to make my grand’d hers. So pretty! I love the colours you used too! 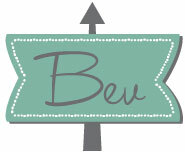 This is adorable, Bev! I haven’t noticed these cuffs at Joann’s before but I’ll be on the lookout for them now. I love this look! Thank you so much for your work here; the design of your blog, your ideas…so great that I even went to Dinosaur Stew to look at their graphics and design work! Such an inspiration! How much is the rhinestone cuff?